Perhaps a better title would be “most of a black silk dress”, as obviously, she’s missing some! Her skirt is missing the bottom half- I am not entirely sure why, as the raw edge is folded under and pressed- it does not look like someone simply hacked it off for the fabric. 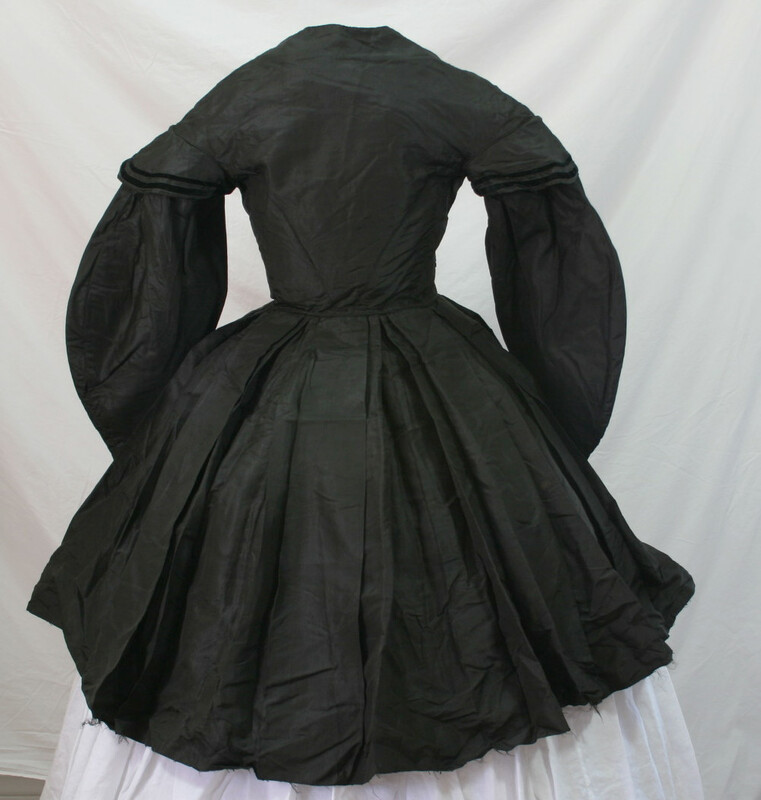 The bodice features wide coat sleeves with sleeve caps and turned back cuffs. The caps and the cuffs are trimmed with 1/4″ silk velvet ribbon. 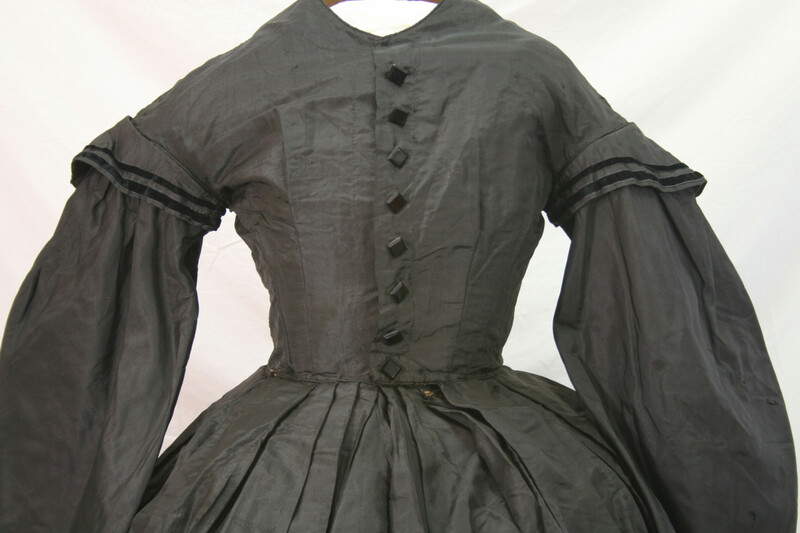 There are decorative square glass buttons down the center front, and the bodice closes with hooks and eyes. 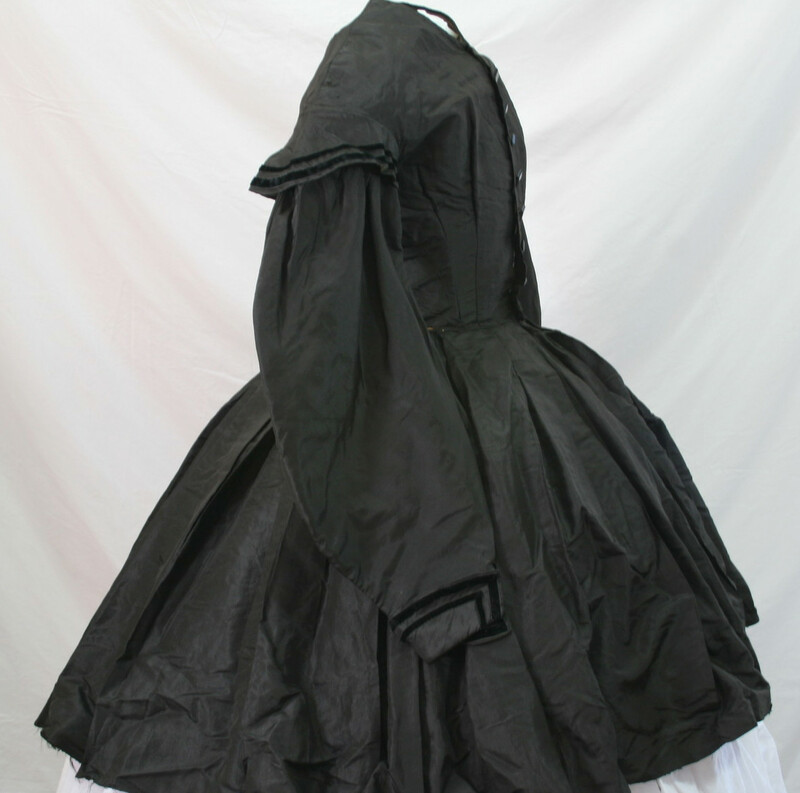 The dress is hand-sewn, with boning in the four fitting darts. There is piping at neck, wasit, and armsyce; as well as in the seam of the sleeves. 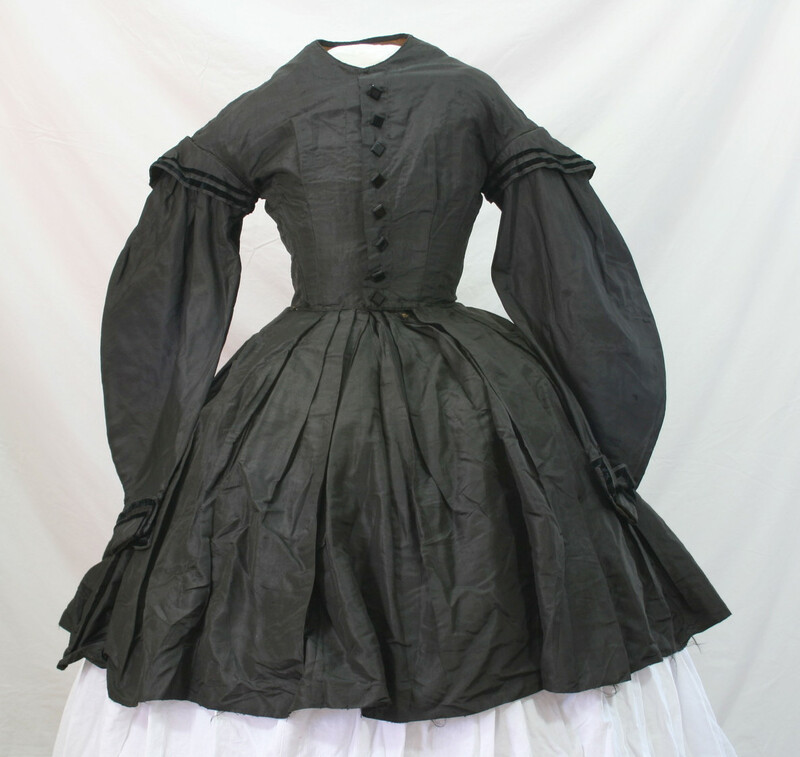 The bodice is lined in a brown plain-weave cotton, and the sleeves are lined in a coarse brown polished cotton. The skirt is box-pleated to fit. The waist is 24″. 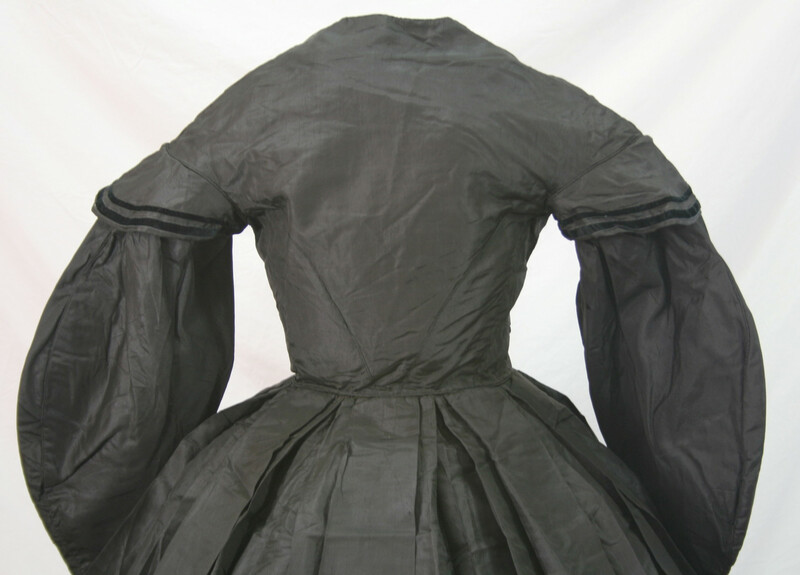 The side back of the seams (this is a true three-piece back) have been top-stitched. 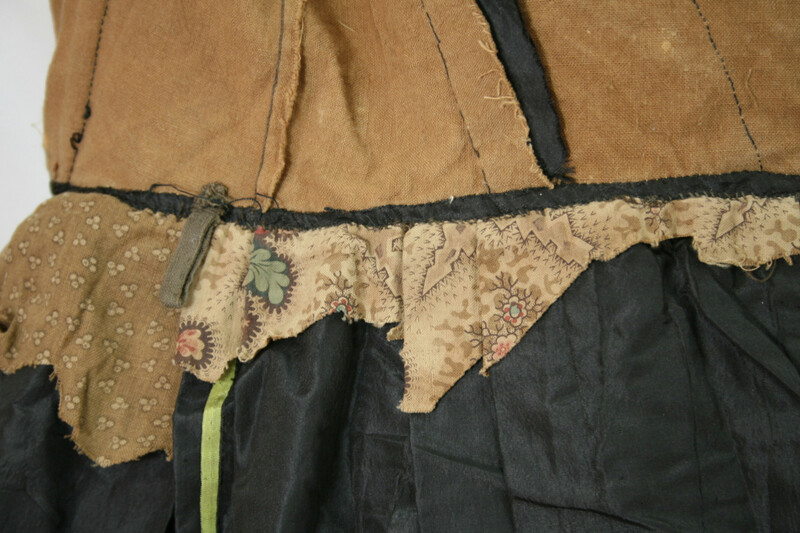 Inside the waist are two loops to hang the garment for storage. There are also two different calico cotton scraps stitched along the waist. I am not sure if just these bits were used for reinforcement, or the skirt may have been fully lined, and that could be the fabric it was cut up for? The edges of the calico are definitely of the “hacked” variety. This is an interesting piece and I can just run amouck with imagining why the skirt was cut away so neatly.